Several farmers around Australia who have trialled Great Plains’ brand new Yield-Pro precision planters on their properties are seeing positive results including savings on seeds and quicker germination. Australian farmers have been rapt with the performance of Great Plains' Yield-Pro precision planters so far. The innovative Yield-Pro precision planting system was unveiled in Australia earlier this year by PFG Australia, and has attracted the attention of farmers with its advanced seeding technology using pressurised air. Victorian farmer Peter Crafter trialled the Yield-Pro planter in May on his 2250ha farm between Horsham and Warracknabeal. With the Great Plains Yield-Pro planter, Crafter sowed five hectares of faba beans and sowed around the edges with a conventional airseeder with a parallelogram tyne set up. "With the Yield-Pro, the emergence was better, faster and we had more precise placing of seed," he says. "We’re very impressed with it and the savings on seed input. The crop’s looking really healthy and we’ve got good, even germination." He adds he would consider using Yield- Pro precision planters for his beans, canola and chickpeas. Neilson Carr farms 800ha at Rokewood, Victoria growing canola, wheat, lupins, beans and oats. He put in one hectare of canola and a hectare of wheat with the Yield-Pro planter a few weeks ago. "The wheat and canola came out of the ground very quickly," he says. "It’s very even and looks good and strong. "With our conventional sowing we used insecticide and trace elements but we didn’t use these with the trial crop and it’s comparing very well." Carr split the wheat into three sections sowing at 30kg, 60kg and 90kg rates instead of his normal sowing rate of 85kg. "We sowed the trial crop about ten days later than the normal crop," he says. "The trial crop came up so quickly there’s not much difference at this stage except that the trial is a lot more even than the normal crop." "With the 30kg per hectare trial that we did, the wheat is almost perfectly singulated out to 20mm and it looks very good. "It’s going to be very interesting to see how it yields with such good separation." He adds the machine is straightforward to use and easy to adjust once he familiarised himself with the machine. "It’s the importance of seed singulation and the savings on seed input," he says. "It not only lowers costs but gives each plant the space it needs to develop and grow well." According to PFG Australia, farmers in the United States who have been using the Yield-Pro planters since 2012 have testified to the benefits of the machines, citing savings on seed, chemicals and time as the main rewards reaped from the innovative systems. Find Great Plains seeders for sale. 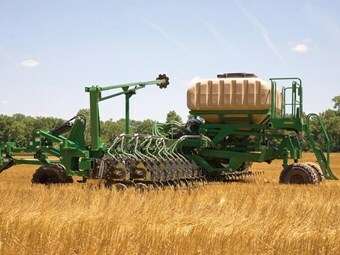 Look up Great Plains seeder specifications.